Security technology - Őrmester Security Plc. The future’s achievements for today’s security! Covering a wide spectrum of security technology, we undertake the comprehensive design, implementation and maintenance of security technology systems from alarm systems in condominiums with 1-2 sensors to the complex property protection systems of large industrial facilities. We meet the demands of the client in every case – following a thorough assessment and consultation, we provide the highest level of professional expertise and an accurate documentation system. We offer a 12-month full guarantee for the systems we install. In the case of entering into a maintenance contract, we monitor and repair the equipment installed by us even after the expiration of the guarantee. Sometimes an installed system may create the illusion that the assets in the cameras’ fields of view are safe but it is not at all certain if the system has not been fine-tuned and tested. 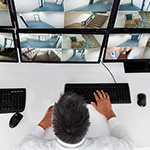 We offer intelligent camera systems that enable immediate action in case of an alarm. Currently, these systems are the leading products on the security technology market. They support the monitoring of employee activities with a range of features, such as – but not limited to – motion detection, license plate recognition, detection of abandoned objects, the counting of objects or persons, camera movement detection, etc. The systems we offer can also be effectively added to existing camera systems. These systems are not exclusively applicable to property protection, they can also be used for the monitoring of industrial processes, quality control and statistical purposes. The shelf system is a fundamental component of security technology in shops. 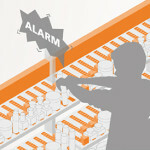 It detects when an item is removed from the shelf, and its analyzer algorithm recognizes unconventional behavior – that is, when a potential thief is lurking in the shop. When that happens, it generates a signal. On the one hand, the signal emerges as an alarm sound, audible to both the staff and the thief. This often has an effect deterring enough for the thief to give up on their intentions. On the other hand, the signal can be fed into the existing camera system, a phone or it can even be transferred to the mobile device held by the security guard.